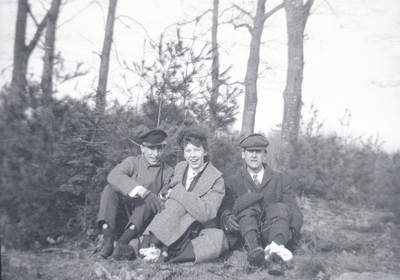 "Wight Family, Young Travelers "
Two young men and a young woman sitting on the ground next to a dirt road. Part of a series of images that show the three walking along the road. Image scanned from a black and white negative saved within items of a family living in Old Orchard Beach, Maine, in the early 1900s. A portion of the family's papers is related to ties to the Socialist Party, but there is no information to identify these individuals, occasion, or location for their walk.